Switch: Digital, in the tailcap. 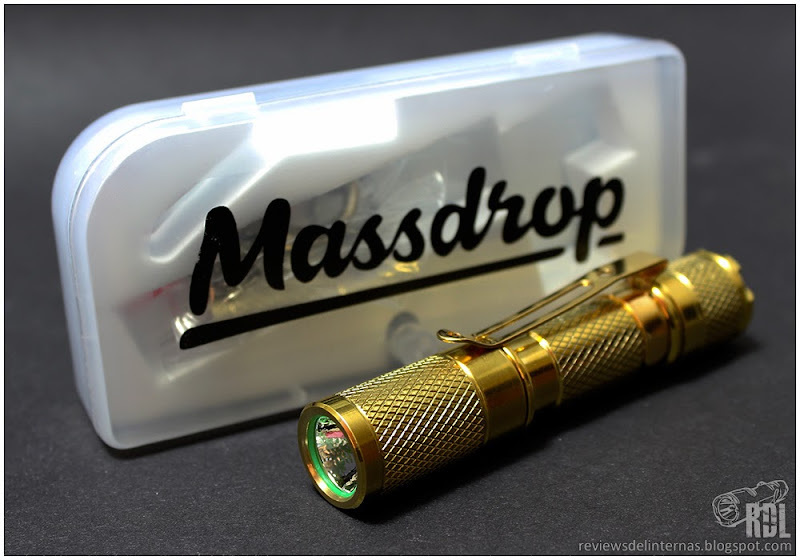 Massdrop, the US-based group shopping discount platform, and more specifically its EDC community has just released its first custom AAA flashlight. 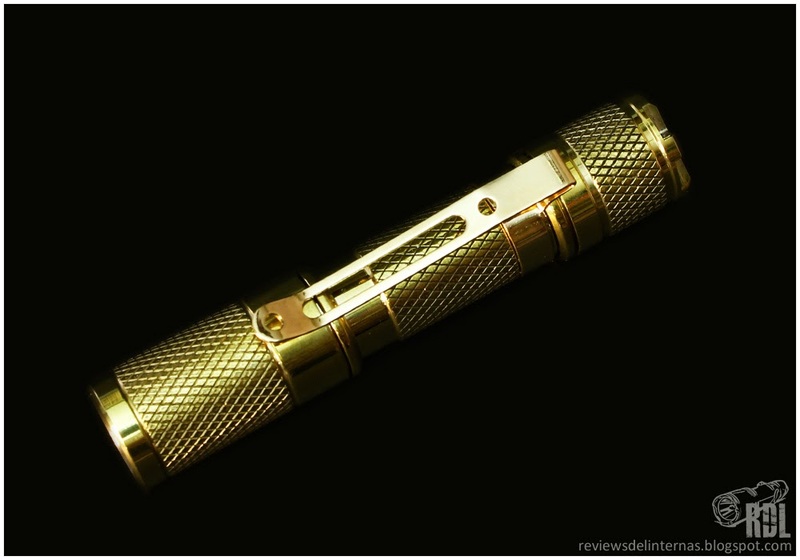 This is a flashlight that many will find familiar, as it is produced by Lumintop. 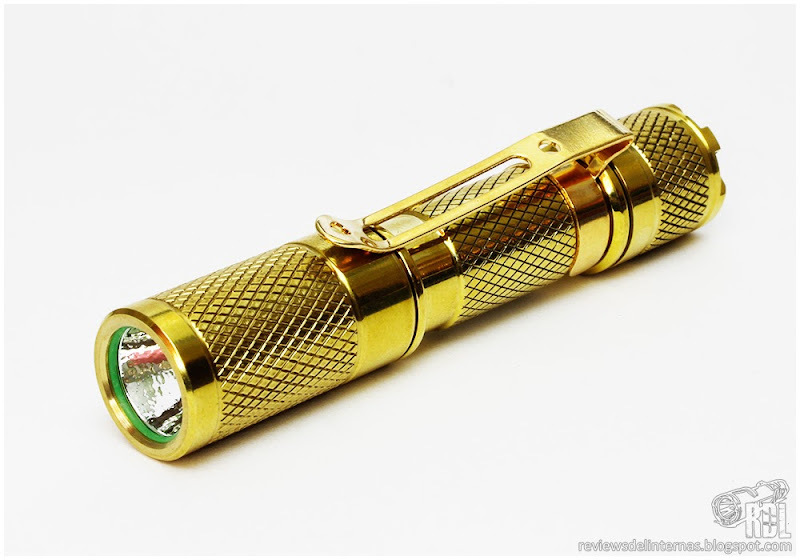 The flashlight comes vacuum sealed bag, to protect the brass from contact with oxygen, thus preventing its premature corrosion. 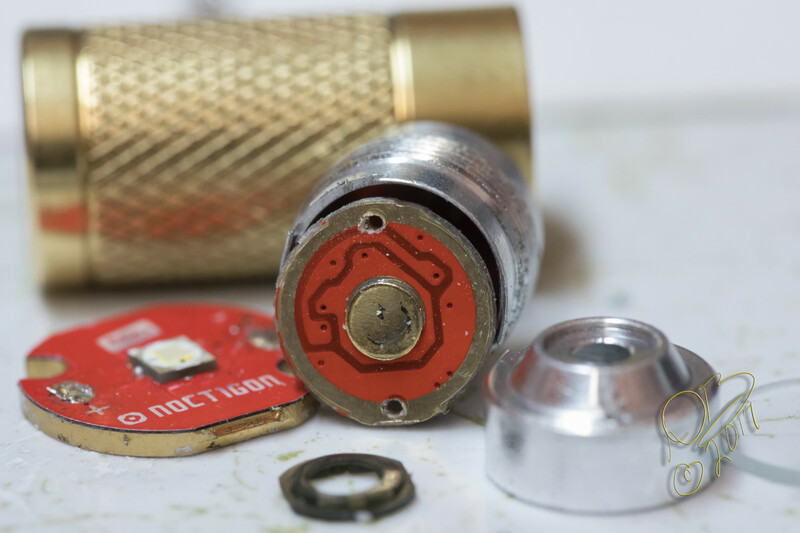 In addition to the flashlight, we will find in the practical plastic box an alkaline AAA battery, a pair of spare o-rings and a key ring attachment. The Massdrop Brass AAA is a small and elegant AAA flashlight machined in brass, with a polished finish very bright and homogeneous throughout all the parts that compose it. It is made by Lumintop, and you could say that it is a Tool Ti, with the head of a normal Tool. 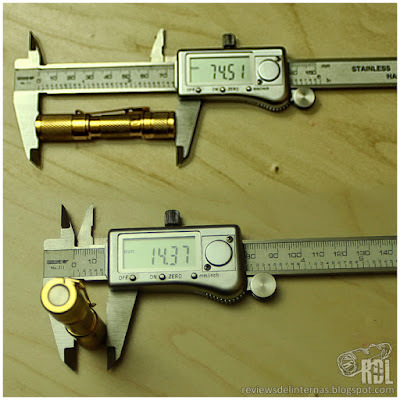 It has almost identical dimensions to a Tool Ti, and a weight similar to that of a Tool Cu. The optics consists of a neutral tinted Nichia 219 emitter, with an OP reflector and a glass lens with AR treatment. The o-ring sealing the optics is green and glows in the dark. 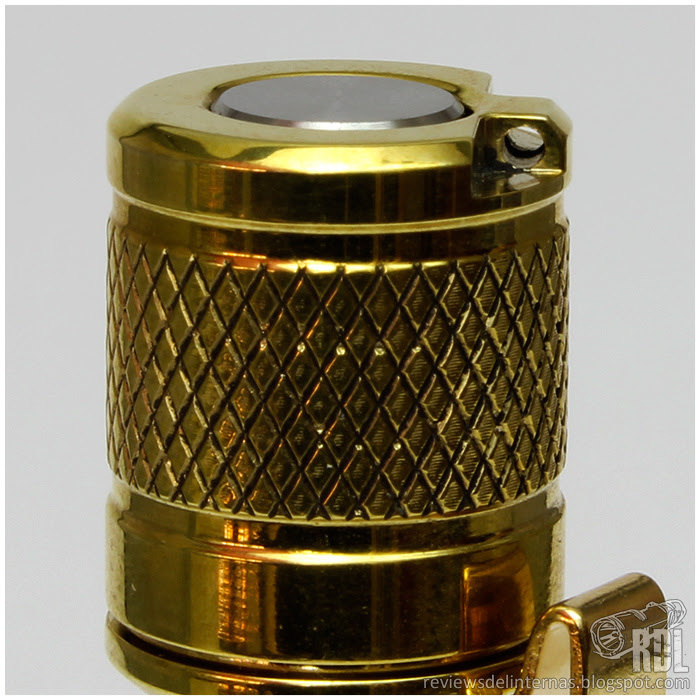 One of the main aspects of the machining of this flashlight is the knurling that covers the three sections of the body. Although it does not have a very aggressive feel, it greatly improves the hand feeling and grip of the flashlight. Inside the head, we have the driver visible which will be familiar if we have seen before a lumintop tool or worm. The threads have an excellent finish, and come perfectly clean. The feel of threading and unscrewing is very pleasant, as is usually the case with brass. 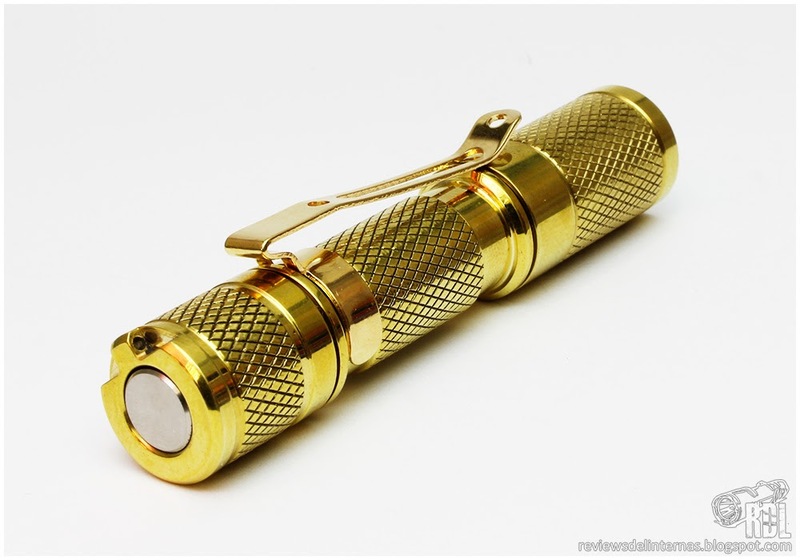 The clip has been gold-plated to perfectly match the golden color of the brass flashlight. In addition to being reversible by having a track on the opposite side of the tube, we can simply swap the tailcap with the head as the threads are identical on both sides. 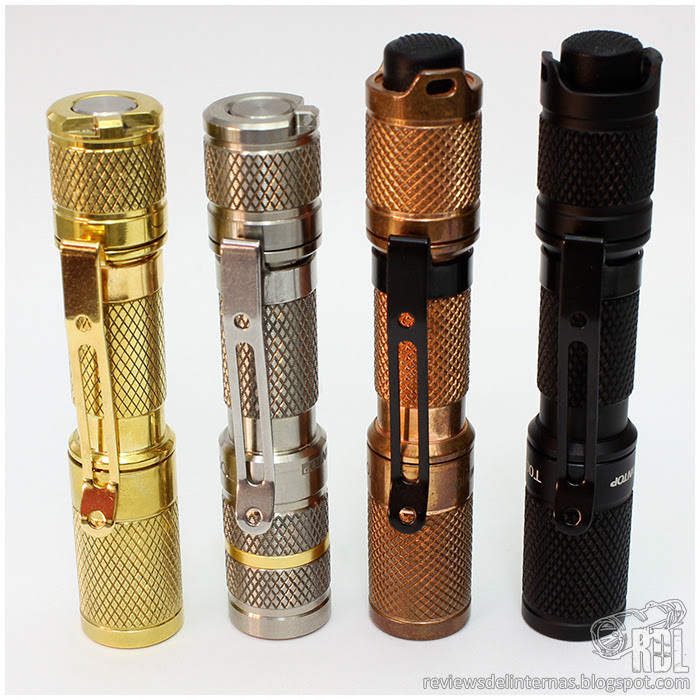 Speaking of compatible threads, if we have other lumintop tool we can make interesting combinations between them, since they are completely compatible. The tailcap hides inside a tiny electronic switch, covered by a small titanium button. 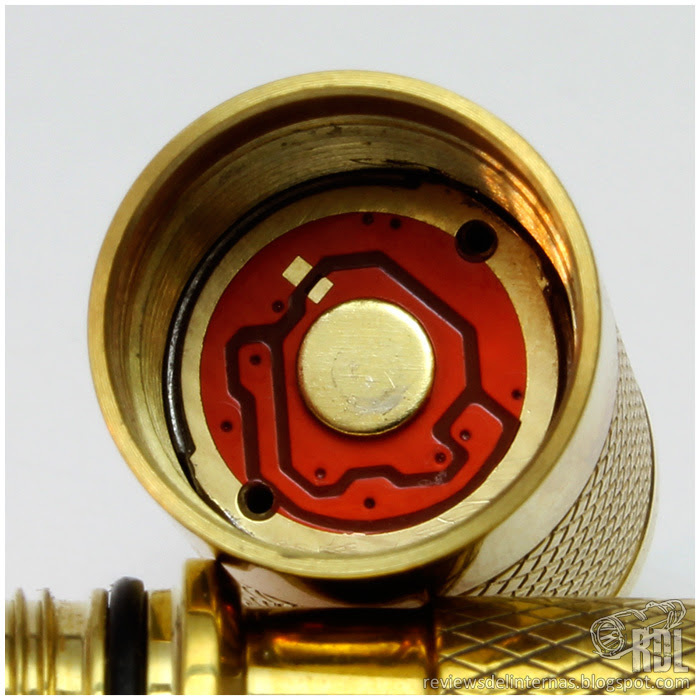 This type of digital switch was first used by Lumintop in its Tool Ti, and has the peculiarity of needing a few minutes with the battery installed inside to work properly in its first use, so don’t panic if your massdrop brass AAA light is not working straight out the box! At the edge we find a small hole for the installation of the key ring. The base of the tailcap is completely flat, so the flashlight can be placed in tailstand. 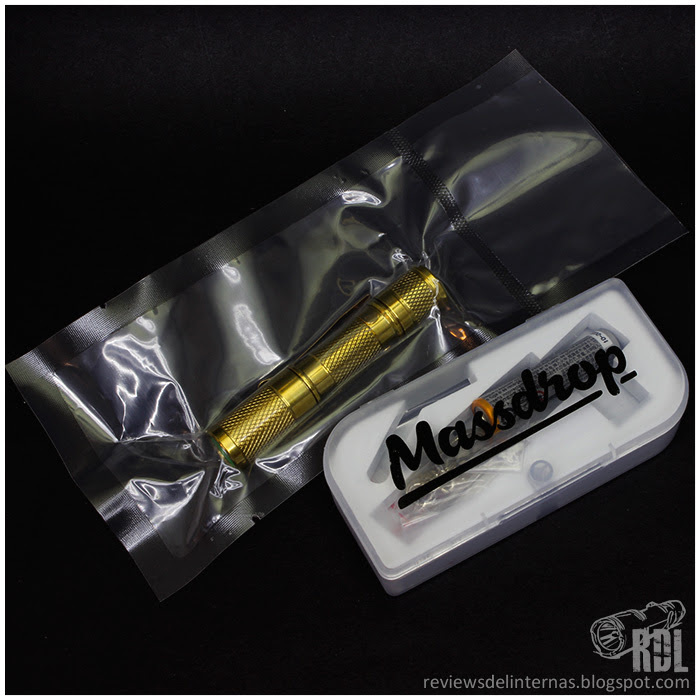 The Massdrop Brass AAA features a common user interface with its Tool AAA sisters, simple but effective. Switching on and off: To switch on, simply click on the switch on the tailcap. To turn it off, simply repeat the operation. Changing modes: To switch between modes, turn the flashlight off and on (within 2 seconds) to jump to the next mode. The order of the modes in this sample is Medium – Low – High, although I think the production units will have Low – Medium – High sequence. 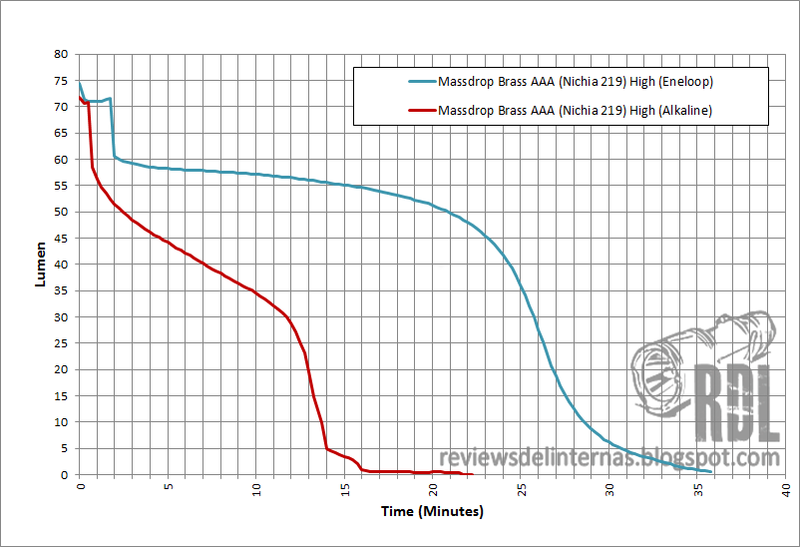 Memory: The Massdrop Brass AAA has no mode memory, and two seconds after it is turned off, it will always return back to Medium mode in the next activation. Block-out: Although the type of switch is not prone to unintentional activations, the flashlight can be locked by slightly unscrewing the head of the flashlight. The distribution of modes is quite good, without great differences between the specified and the measured. 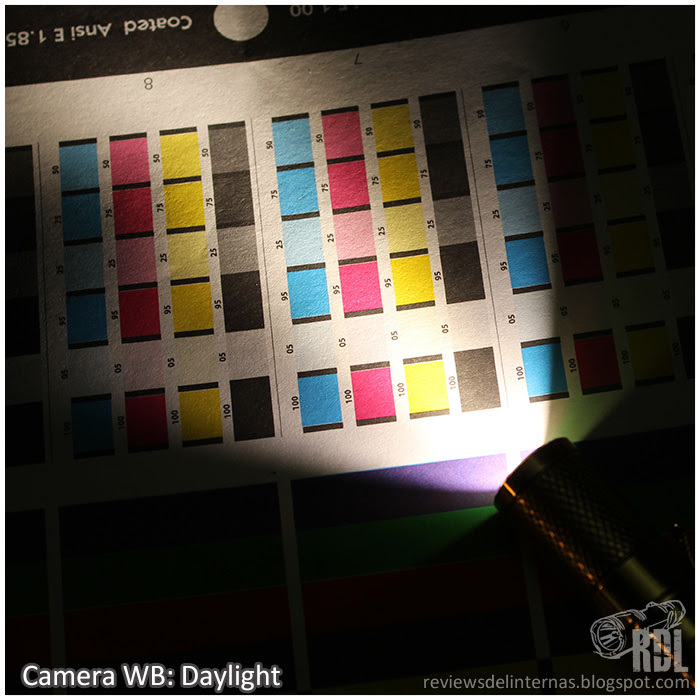 This neutral tint version with Nichia LED emitter is significantly less powerful than the cold tint version and CREE LED. The modes are achieved by regulated current, without PWM traces in any of the modes. 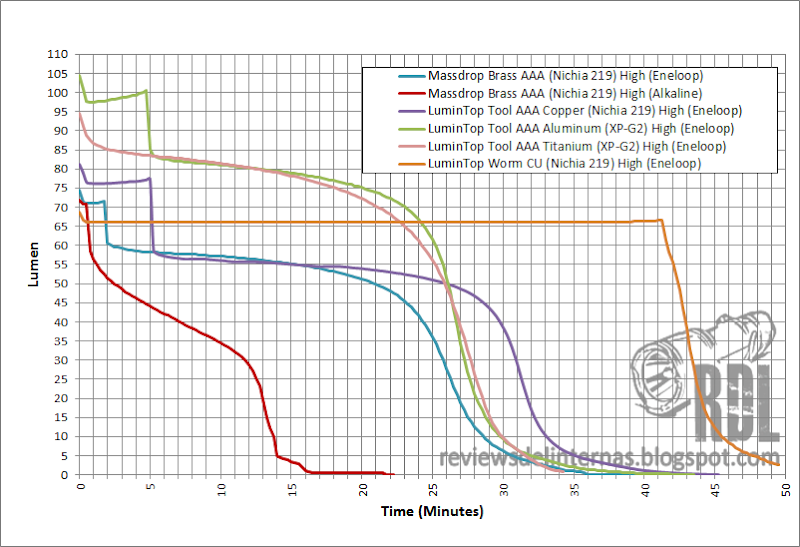 The performance and efficiency is quite poor, as has been seen in recent releases by lumintop. During the first minutes with an Eneloop the flashlight seems to try to maintain a regulation and we see as even the output grows slightly before falling and start a second unregulated phase in which the output is gradually decreasing. With the alkaline is much worse, and just 30 seconds after turning it on, we see a marked drop in performance. 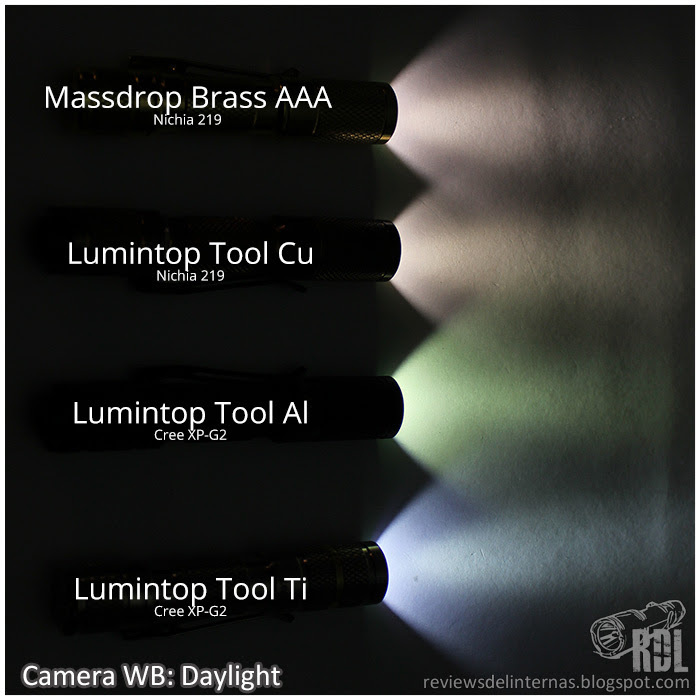 Compared to other Lumintop flashlights, the performance is similar. Lumintop seems to have created a whole generation of very inefficient AAA flashlights. The beam profile is exactly the same as that found in Tool AAA. The Nichia emitter tint is very nice, with a really good neutral tone. 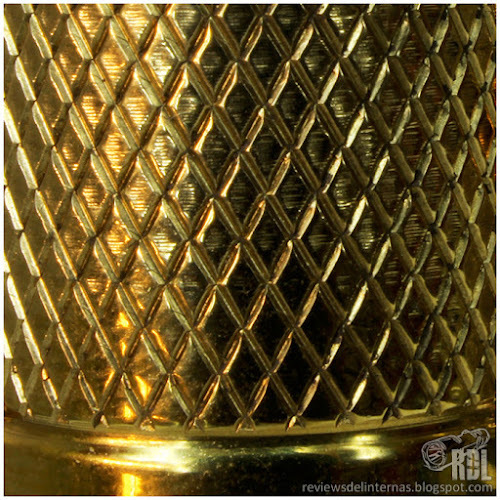 Very similar to that found in the Tool AAA Copper Nichia, and (thanks god) far from the green of my old Tool AAA aluminum. 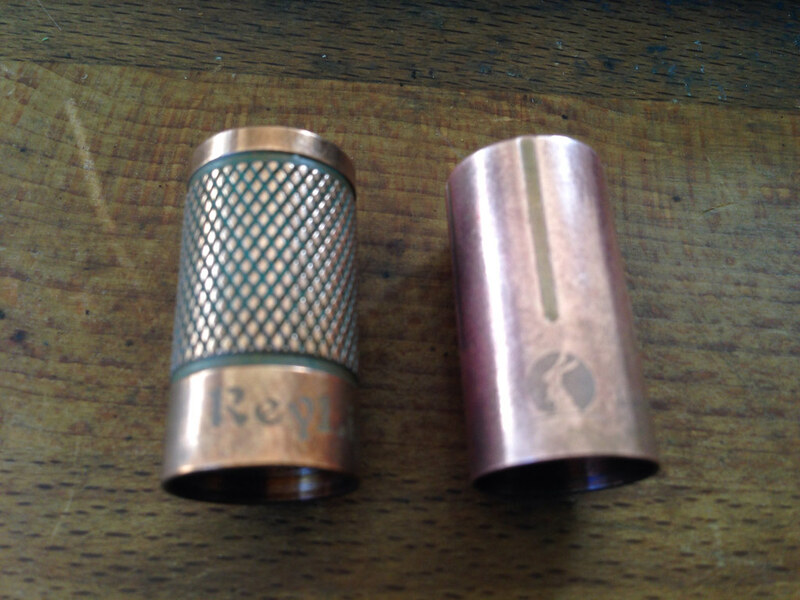 More details in the review of the Tool AAA Copper. 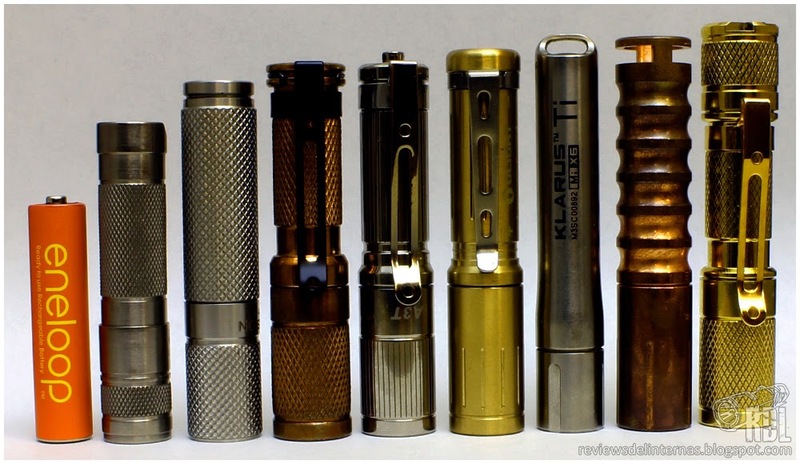 This type of EDC flashlights on not so common metals are becoming increasingly popular within the community for daily use flashlights. 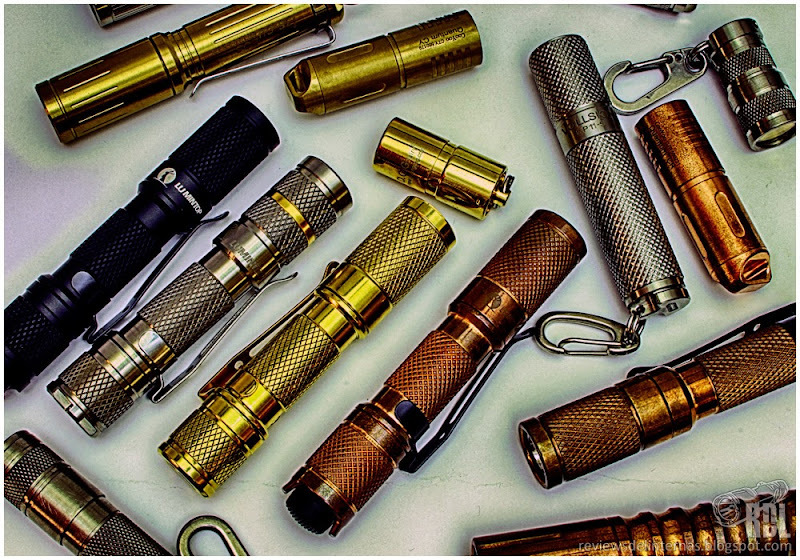 Not very long ago it was hard to find a keychain/EDC flashlight that was not made of anodized aluminum or steel, but little by little copper, titanium and, why not, brass flashlights are making their way into the already saturated AAA flashlight market. 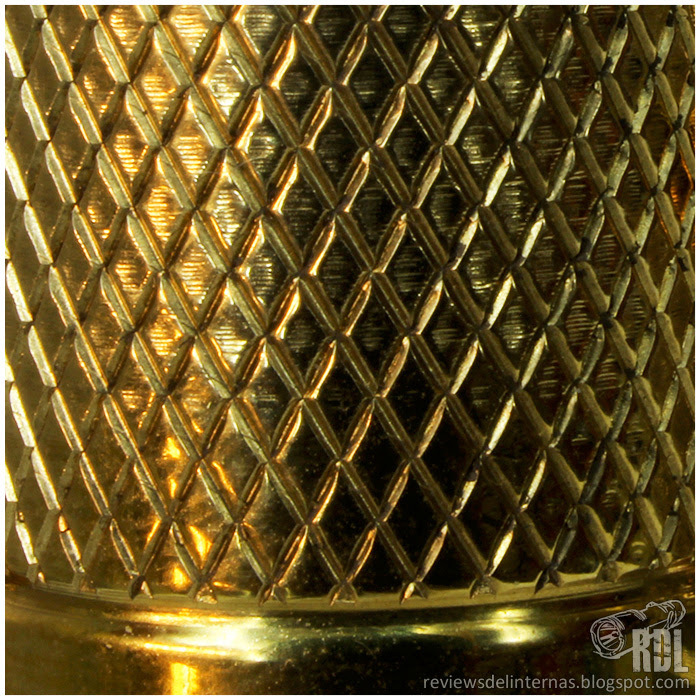 The brass, as a copper alloy, has an high density and therefore a weight significantly greater than the one would be obtained with light metals such as aluminum, but on the other hand offer excellent thermal conductivity, which makes it able to dissipate much better the temperature generated by the LED, and therefore reduce the stress on the emitter. 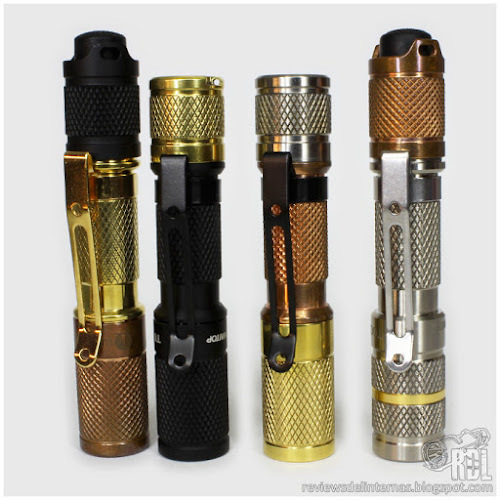 Negative aspects: The poor performance is undoubtedly the aspect with more room for improvement of this flashlight. I do not know if it is due to being a pre-production sample, my own bad luck or an error when specifying the modes/runtime by the engineering team of Lumintop, but the truth is that all models of this brand that have gone through my hands in recent times share this unattractive feature. Positive aspects: The mechanical finish of the flashlight is excellent. The detail of bathing the golden clip to match the brass tone of the body of the lantern has surprised me very pleasantly. 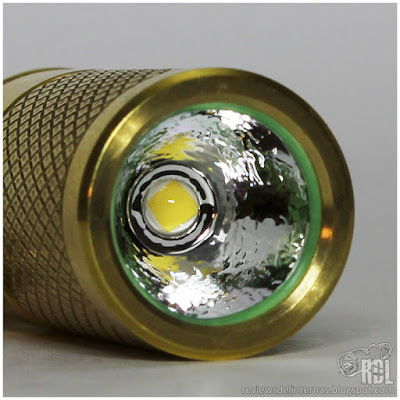 The design, although inherited from Lumintop’s Tool AAA, is really good, and I personally always feel attracted to those lanterns in which the knurling is a predominant part of its external appearance. As always, the fact of offering two tints is something to be valued very positively. Review sample provided by Massdrop for analysis, test & review. Thanks! Please note: Massdrop page is still not available, but it is expected to be alive very soon. 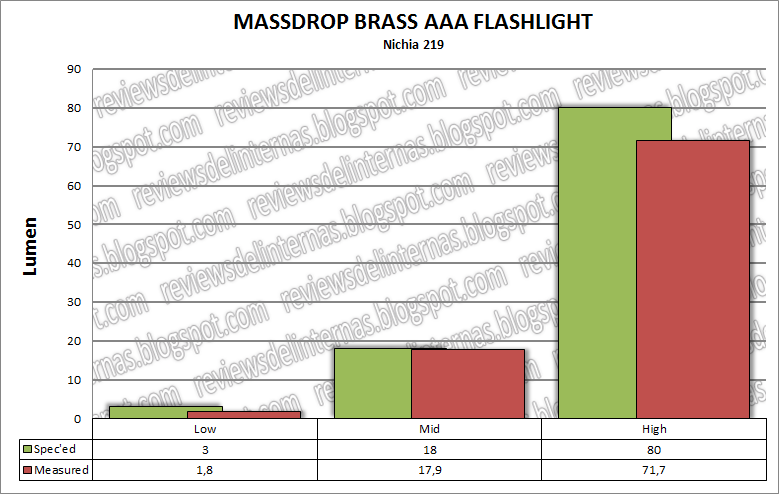 Lumintop seems to have created a whole generation of very inefficient AAA flashlights. 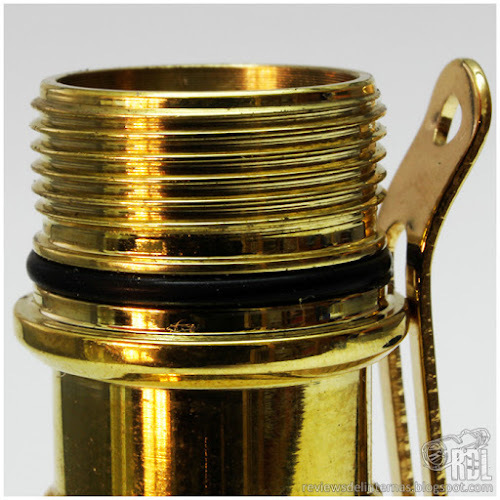 here is another brass tool, but its not Nichia.. however, it shows flat regulation on eneloop. I cannot explain why maukka and will show flat regulation on their Tools, when upz does not get flat regulation, except on the worm. Wow, after reading this, gotta wonder who would want one with such an awful runtime. And I’m sure it must be very pricey to boot. Going to buy. Going to buy. Going to buy. Must point out if I could apply some type of coating to the flashlight to keep it shiny I would like it much better. Not sure how, but I missed this one. Would have done it in a heartbeat! 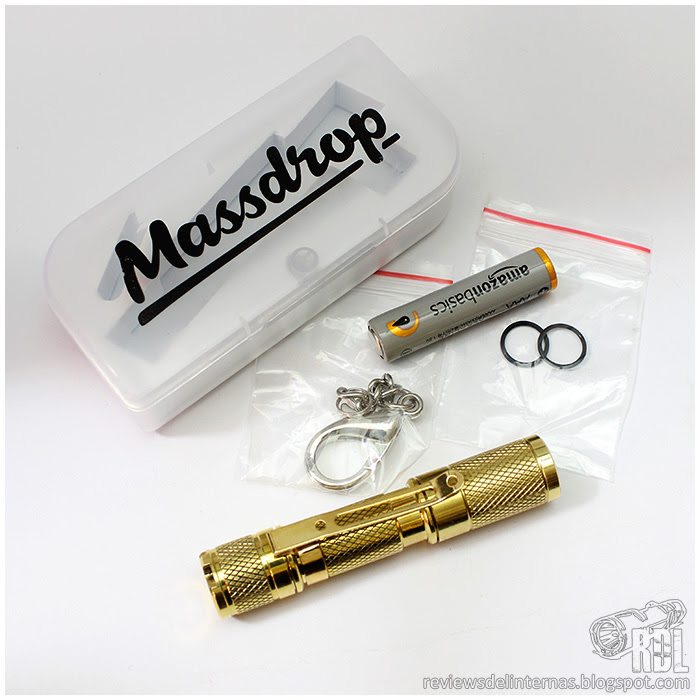 Note: The Massdrop Brass AAA Pocket Flashlight will be available for $24.99 starting 1/31/17 at 6AM PST. 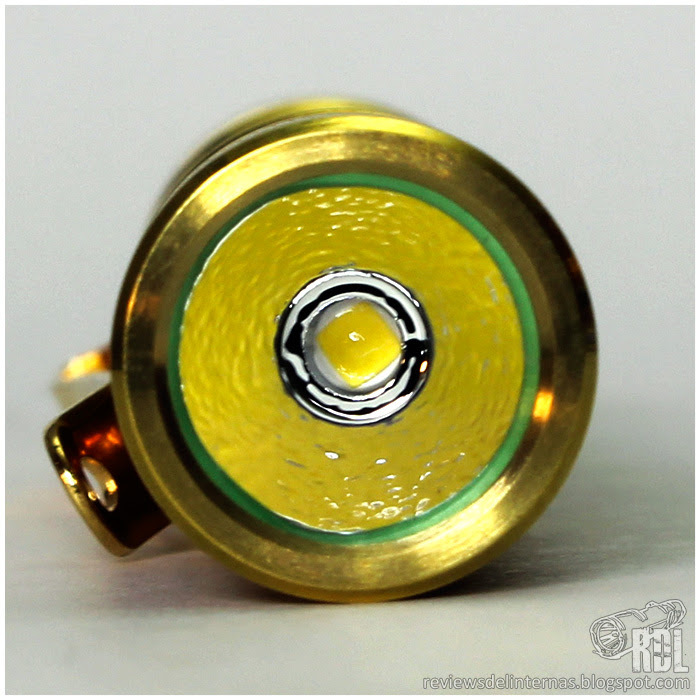 At checkout, you’ll have your choice between the CREE XP-G2 R5 LED and the Nichia 219 LED. I really don’t know what’s going on with this different performance samples. 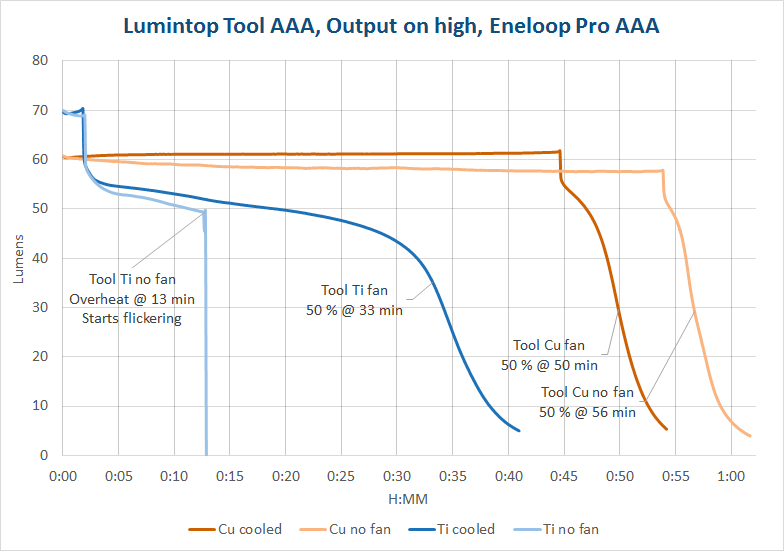 Tool AAA Cu, Al are review samples and Lumintop claims they’ve different drivers and LED bins from production units. Worm Cu and Tool Ti are production samples (ordered by myself) and actually the Worm performs better (not great, but better). Clearly not the same board. 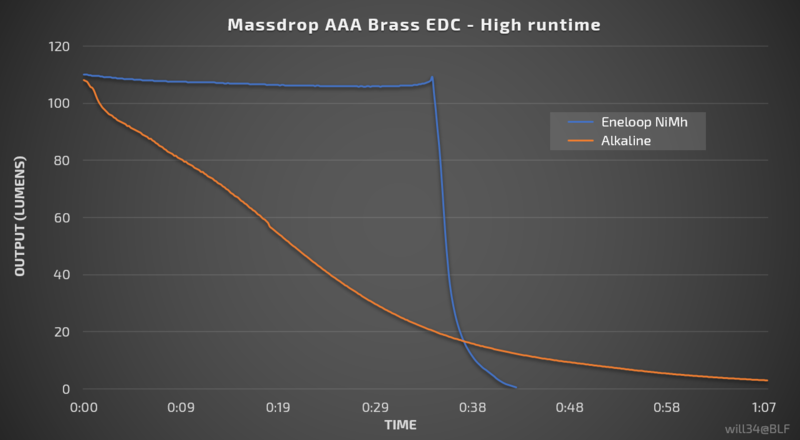 Maybe that’s the reason for different performance on different samples. Thanks you all guys for reading and leaving a comment! Please, explian. Not sure if I am understanding you right. Thanks as always for an honest review!!!. As always, you are the most reliable of reviewers. Reviews are a form of advertisment, that’s all. I didn’t say it’s negative, because there is some great advantages for the customers. The brand get a free advertisement on potential customers (BLFers) and the forum get an honest review of the product. I’ll wait for the Lumintop one, with a Gearbest coupon… then it will be Worth the twentish dollars. Did you not notice the price is ALREADY at $25.. This is not a $50 offering.. you are the second person to think that.. I dont know why. Well, I find that statement pretty offensive. Shill-posting is NOT reviewing. Dont be offended. You are not a shill, any more or less than several other people that have reviewed their free samples. It IS a marketing tactic by Massdrop, to populate the forum with reviews. It is Social Media Advertising. Your contributions are still valid. I particularly appreciate that you have gone the extra distance to examine performance and post your measurements. Some reviews simply re-state the specs, and reposts the stock images, and nothing more. I consider those much more shilly than your review. imho, anyone who receives a free sample, is vulnerable to the accusation that they are shilling, and I would say that they are at the very least being used to promote a product. Not with bad intentions, nor deception.. just a Social Media Marketing strategy by the Vendors. It’s smart marketing on the part of the store or manufacturer. 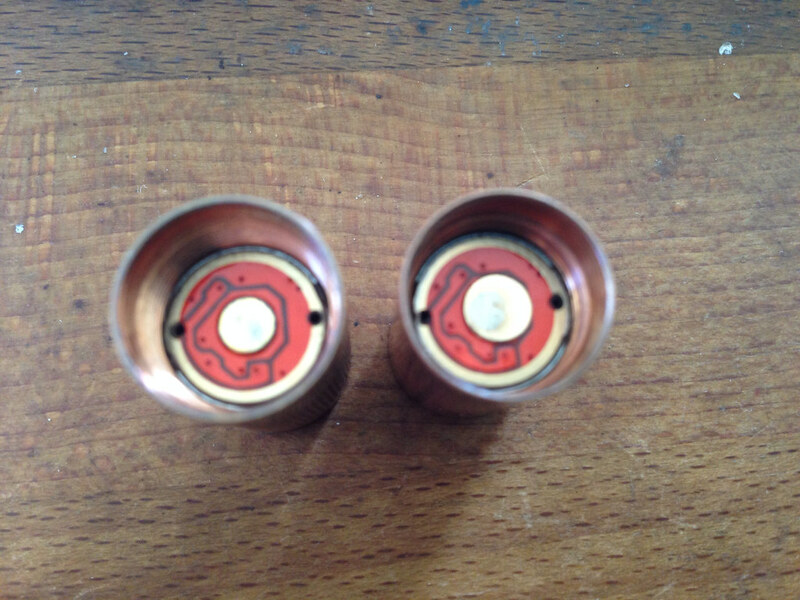 Give a light to a known flashaholic, let him express what it does, doesn’t do, and how easy it is (or isn’t) to mod… builds interest and desire amongst the community and their sales go up. Pretty old concept of course. A “free” sample is the bit that is confusing. They give me a $25 light and I spend 3 days doing a review, so I’ve spent hundreds of dollars of man hours and bandwidth to show y’all what I’ve got, hardly free, the reviewer gives a lot of time and effort to the community. Well said Dale! 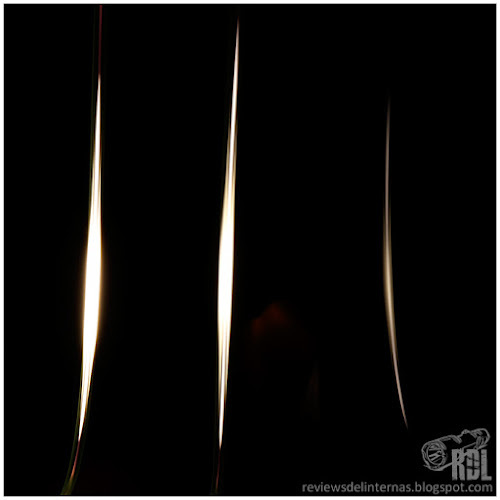 A review takes a lot of time, specially for those who processes their images one by one after being taken from the camera. None of the stuff I receive to review is worth more than the time I spend to review it, I do it because this is part of the hobby, and I love testing out stuff. Yep. I agree. The amount of time and effort doing a review? For what most lights cost, it’s less than a few dollars an hour, if that. There are better ways to make money etc. The reviews are done for the good of the community and as a hobby. A free light is just a little carrot for fun. It encourages a review but doesn’t shape it (unlike old Amazon reviews). Offensive too, as UPz stated. A review with technical data (honest) and beam, is not advertising, it is information. Copy technical data of the brand is advertising. But getting your own technical data like here, is information that I appreciate. I know the time and effort that is spent on a quality review. I like the pics of this, I like the technical values (one of the best integrated sphere that I know), I like the beams…. Great review, thanks UPz. Regulation kills it for me though. Clearly not the same board. here is a ReyLight on the Left, and a Worm on the right. The Low on the ReyLight is 1 lumen, and comes first, the Low on the Worm is 3 lumen and comes second. Just got notice my flashlight shipped. Anyone else got the notice?